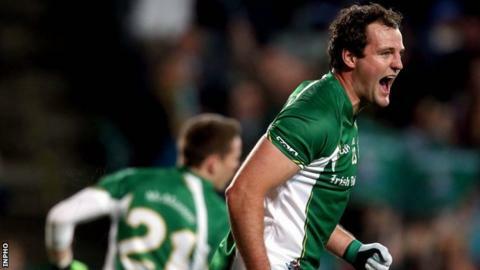 Donegal's Michael Murphy has retained his position as Ireland International Rules captain for the one-off Test with Australia in Perth on 22 November. Paul Earley's 25-man squad has eight other players from Ulster counties including Tyrone trio Niall Morgan, Sean Cavanagh and Mattie Donnelly. Donegal's Neil McGee is also picked as are Monaghan duo Darren Hughes and Conor McManus. Derry's Chrissy McKaigue and Down's Kevin McKernan are also included. Ireland won last year's two Tests convincingly against a weakened Aussie team which only included indigenous players but the host have named one of their strongest line-ups for many years for next month's one-off game. A 40-man extended Irish squad has been working together for the last number of weeks, but the reduced group of 25 was unveiled by Earley on Tuesday morning. Ireland have won the last two series, played on successive weekends, by comfortable margins and the organisers have stated a desire to make the contests more competitive. In total 15 counties are represented across the Ireland panel although All-Ireland champions Kerry [David Moran] and Dublin [James McCarthy] both only have one representative in the squad. Mayo lead the way with four home-based players included, as well as Brisbane Lions' Pearse Hanley, the only AFL-based player included in the visitors' panel. The team management has also confirmed that Cork's Aidan Walsh will fill the role of vice-captain. Ireland depart for Australia on 12 November, with their itinerary including a warm-up game in Melbourne against a VFL selection on Sunday, 16 November. "We travel to Australia anticipating a very strong challenge from the hosts," said Earley. "The players who we have chosen have worked hard in recent weeks and and have shown many of the attributes that we hope will allow us to build on some of the promising aspects of last year's series performances." In the history of the sport, Ireland have nine series wins, with Australia one behind, and looking to level the record books in 2014. Ireland panel: Colm Begley (Laois), Colm Boyle (Mayo), Seán Cavanagh (Tyrone), Cathal Cregg (Roscommon), Mattie Donnelly (Tyrone), Finian Hanley (Galway), Pearse Hanley (Brisbane Lions), Darren Hughes (Monaghan), Lee Keegan (Mayo), James McCarthy (Dublin), Ciaran McDonald (Tipperary), Neil McGee (Donegal), Chrissy McKaigue (Derry), Kevin McKernan (Down), Kevin McLoughlin (Mayo), Conor McManus (Monaghan), David Moran (Kerry), Niall Morgan (Tyrone), Ross Munnelly (Laois), Michael Murphy (Donegal, captain), Colm O'Neill (Cork), Pádraig O'Neill (Kildare), Paddy O'Rourke (Meath), Aidan O'Shea (Mayo), Aidan Walsh (Cork, vice-captain).